Remember, as a US citizen it's morally and legally incumbent upon any person to report a crime especially when that crime is a capital crime of murder.The University of New Mexico along with the United States Government are doing the unthinkable. They are deliberately blocking my E-mails to prevent our countrymen from learning the truth about what took place at the World Trade Center and the Pentagon. There is tangible evidence that Bush murdered our own people to create a fictitious justification for war to usurp Middle-Eastern oil and now our country is in serious jeopardy as a result. How unprincipled and shameful can an institution and our government be than to become privy to a conspiracy such as this? (the murders of our own citizens) America needs you now. Please help. Please inform as many people about this website as you can. We need to take our country back. Because I'm a victim of Governmental terrorization implemented by the Bush administration to enforce a twisted family values I sent Heather Wilson, our congresswoman, an e-mail in an emergency to help abate the adversity I was being forced to ameliorate. I tried to explain to her prior to the 2004 elections that my life was being threatened, I was being arrested for fictitious crimes beaten and then released, and I was even being shot at by the Albuquerque Police Department. In the reply I got she stated that she was being terrorized by terrorists using Ricin and she couldn't answer her e-mail at this time. It looked like a standard letter sent to everyone in her district as a ploy to gain favor during election time. I wanted to laugh remembering the fiasco of the Anthrax virus and knowing where it came from, (our own government) but my situation was very grave. I didn't expect any help from her by viewing her record in Washington DC and living in her district, and I didn't get any, but I couldn't afford to overlook any possibilities. But you know what I find very strange is that after the elections were over we didn't hear anything more about the Ricin attacks. How about that! Boy, those terrorists sure know how to plan an attack. One of the reasons that I know that the Anthrax Virus Attacks was a ploy setup by our government is this: Heather Wilson, and the Bush administration along with many other members of Congress such as Hillary Clinton displayed unctuous efforts for Homeland Security? The reason I use the words unctuous efforts is that in her district in the City of Albuquerque, New Mexico there are many illegal aliens and it is very prevalent. So prevalent that in fact illegal aliens get free day care for their children funded by the City of Albuquerque at the Herman Sanchez Community Center on Williams Street. They even get free groceries at the Store House at the corner of Broadway and Central Street. They even have their own laundry mat the Rio Bravo Super Wash on Rio Bravo. Illegal immigration is so common place that someone tried to sell me (prior to 9/11) a Social Security card on Central Street that you fill in yourself by adding any name and number of your choosing with a type writer. There were even twenty illegal aliens picked up at the Kirtland Air Force Base with phony identifications. I stopped to ask a road worker what they were going to install under the road and none of the road crew could speak English. It has been more than four years since 9/11 and the State of New Mexico is still full of illegal aliens. I believe that this would be alarming to anyone that really believed that our country was under attack especially to a once member of the military and now a member of Congress. If Heather Wilson is so concerned about terrorism and terrorists attacks and she was even being attacked her-self then why is all this illegal activity and possibly very dangerous activity taking place in her district? She'd have to be a complete idiot to overlook this, or she'd have to be well aware that the terrorist's threats are only a sham. Do you think? You know even if we were not supposedly under attack employing illegal aliens without a visa is a criminal offence. Why are the City of Albuquerque and the State of New Mexico allowing this to happen? Why does the State of New Mexico and the City of Albuquerque only enforce the laws that are of their choosing? It's obvious that illegal Immigration only lowers the standard of living for all working Americans by providing cheep labor for the rich, and they also threaten the security of our nation so we are led to believe by our government. How dumb does the Government think we are? I wish that the government would quit trying to play us for idiots. Our what I should say is: "How corrupt can a government get?" In my estimation Heather Wilson knowingly and deliberately went on television to mislead the American people by blasting her constituents for taking money and lavish gifts from Jack Abramoff and failing to mention the $1,000 gift that she received herself in March of 2002. Despite the Anthrax attacks (Which ultimately the Anthrax used in these attacks had been proven to belonged to our own government and during these attacks high-profile Democrats were targeted.) and even the email that she had sent me proclaiming to be under attack herself with a new terrorist's weapon during election time in her district called Ricin she is not alarmed. We can extrapolate this via her voting record. By viewing Heather Wilson's voting record on immigration it's obvious that Heather Wilson had no fear or did she believe that our country is under attack and that terrorists would enter our country illegally as we are led to believe by our government to support the war on terror and to justify the invasion of Iraq. Why Heather Wilson's actions are contradictory and how she voted on Homeland Security. Here is how she voted. More on how Heather Wilson voted on Energy & Oil. A fool can extrapolate this ulterior motive. It doesn't take a mental giant to deduce that the terrorist's attacks are only a ploy used to deceive the American people by our government. Heather Wilson has proven that she is quite capable of misleading the people of our country for her own avaricious gain. All the evidence in Bush Lied Thousands Died proves that our own government murdered our own people to mislead us into believing that we were under attack to create a fictitious justification for war to usurp Middle-Eastern oil. In my estimation it is quite possible that Heather Wilson along with many other members of Congress in Washington that go along with this machination are traitors and are conspirators to cover up the murders of our own citizens in New York and at the Pentagon and should be dealt with accordingly. I love my country, but I'm ashamed of my government. We need to take our country back. (a) Except as otherwise provided in this section, WHOEVER, in any matter within the jurisdiction of the executive, legislative, or judicial branch of the Government of the United States, knowingly and willfully? (a) shall apply only to? Abramoff pleaded guilty Tuesday to three felony counts of defrauding his own clients. He has agreed to cooperate with federal investigators probing alleged corruption in Congress. 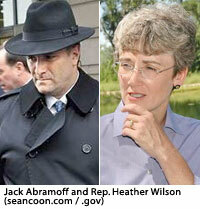 According to Federal Election Commission records, Abramoff gave Heather Wilson $1,000 in March 2002. No records of contributions from Abramoff to other members of New Mexico's congressional delegation could be found searching the FEC Web site.